The Alamo Grounds are lit up for the holidays! For many, visiting the Alamo during the holidays is a tradition. If you haven’t visited recently, this is the best time of year to do so. 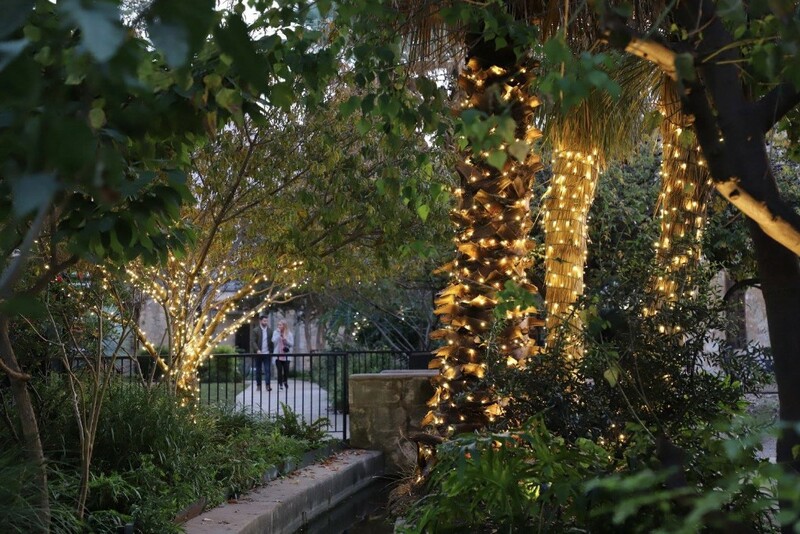 The holiday lights on the San Antonio River Walk has been a local favorite for many years, and now the Alamo grounds are decorated for the holidays as well. The combination of these two beautiful, San Antonio-specific landmarks (the River and the Alamo) are worth a trip downtown on their own, and the holiday decorations only add to this pairing. There will be Christmas trees in the Alamo gardens, festive lights throughout the grounds and of course, the H-E-B tree in Alamo Plaza. While visiting the Alamo anytime during the year is a good idea, the cooler winter weather makes visiting much more comfortable. Visiting the site of the 1836 Battle of the Alamo will always be a major reason to stop by the Alamo, but there may have been several additions to our site since your last visit. First, there is our special exhibit Fortress Alamo: The Key to Texas. Fortress Alamo, which opened earlier this year, explores the long history of the Alamo as a fort, and the role it played in creating the city of San Antonio. 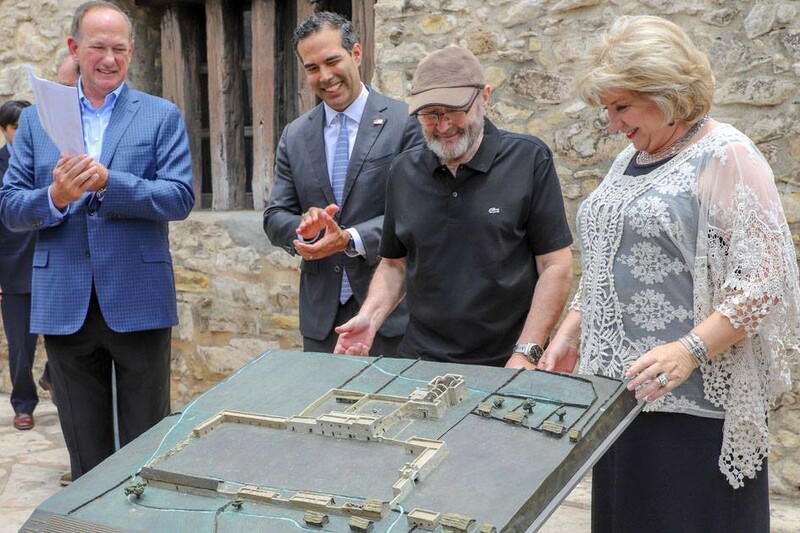 Phil Collins unveiling one of the Alamo Bronze models. In June, British Rockstar and Alamo-history enthusiast Phil Collins donated seven bronze Alamo models. Created by George Nelson, author of The Alamo: An Illustrated History, these models depict the Alamo through different periods of time, including: 1744, 1785, 1793–1835, 1836, 1836–1845, 1861, and 1900. These models can be viewed at all times outside of the Long Barracks in Alamo Plaza. 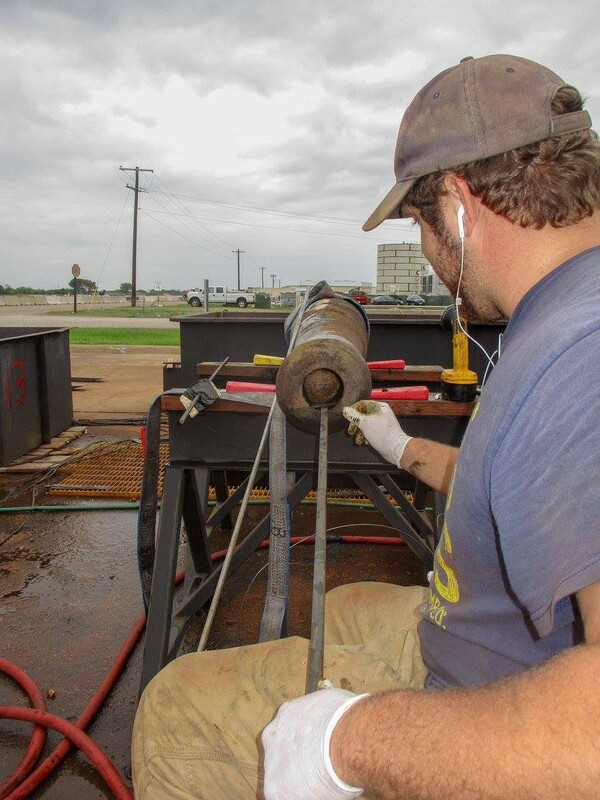 In August, the Alamo battle cannons returned to the grounds after being restored by Texas A&M University. Six of the battle cannons can be viewed in the arcade, in front of our special exhibit hall. Each is accompanied by an informative panel, detailing the restoration process and the information learned from it. Texas A&M found an unfired cannon ball while restoring the Alamo battle cannons! Our Living History Encampment in the Alamo Gardens has daily living history demonstrations where you can see what life was like during the Texas Revolution. If you were thinking of stopping by for only a picture in front of the iconic Alamo Church before going to your next destination, you should definitely take the time to walk onto the Alamo grounds for our living history encampment. You can learn about period-appropriate crafts and activities, or even see a live firing demonstration. Our living historians are always willing to discuss what they’re doing and the history behind it with visitors, so feel free to interact with them. Seeing first-hand what life was like on the Texas frontier in the 19th century is a truly unique experience that all Alamo visitors should take the time to see. To make visiting easier, the Alamo will have extended hours from Nov. 30 through Dec. 30. During this period, the grounds will stay open from 9 a.m. — 7 p.m. Monday through Thursday, and 9 a.m. — 8 p.m. Friday through Sunday. The Alamo will be closed on December 25th. As always, visiting the Alamo is 100% free though there are guided and audio tours available for purchase. We encourage you to visit the Alamo this holiday to see everything we have to offer. Most importantly, we encourage you to honor the sacrifice the defenders made in 1836 and as always, remember the Alamo!